Hard to believe we’re halfway through August already! Seriously, where did the summer go? 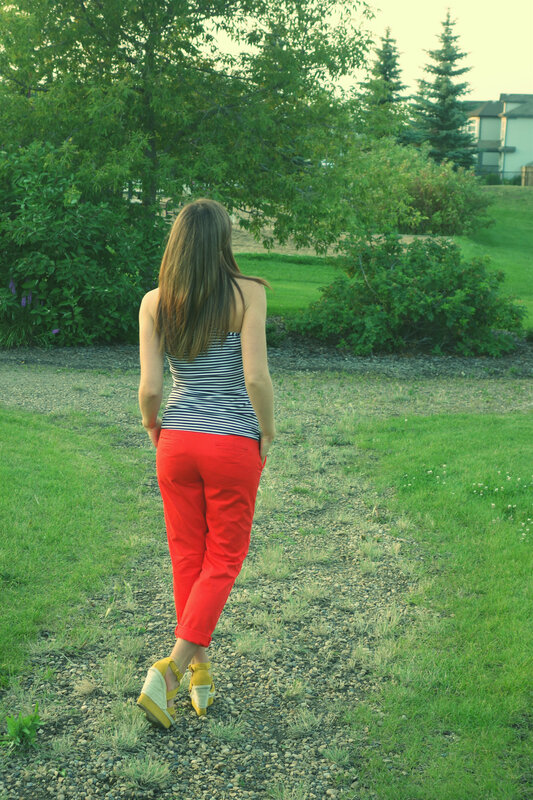 I did a little shopping today and I found these red khakis at the GAP for $29.99! Then I asked them if they had anymore colours and they had a rainbow. I got some in peach also and they were on sale for $11.99! It was such a happy surprise. The red had me feeling really nautical, so I knew that stripes were in order. Two things I really noticed about these pictures are that 1) Summer is almost over and I have NO TAN! Everything I got on my honeymoon is long gone. Too much working indoors. 2) My hair is atrocious, it looks so bad, I can’t wait to chop it all off and get rid of the brown on Saturday. I made Mexican Stuffed Bell Peppers for my hubby and I for dinner, they were so good. I love anything Mexican, and beans beans beans! All the beans in the world! Recipe to follow tomorrow, they are dead easy. Have a great week! Great outfit, I love the color of those pants! Thanks! The peach ones are really cute too! DONT YOU DARE TALK ABOUT THE HAIR THAT WAY!! IT DESERVES ITS OWN BLOG!! !